From The Dinner Party at the Brooklyn Museum to Judy Chicago’s home in Belen, New Mexico, Judy Chicago speaks of the importance of art and archives in transmitting women’s history to future generations. The Judy Chicago Art Education Collection, one of the most important private collections of archival materials on feminist art education, is now open to the public at Penn State University Libraries, 104 Paterno Library, on the University Park campus, as well as online. 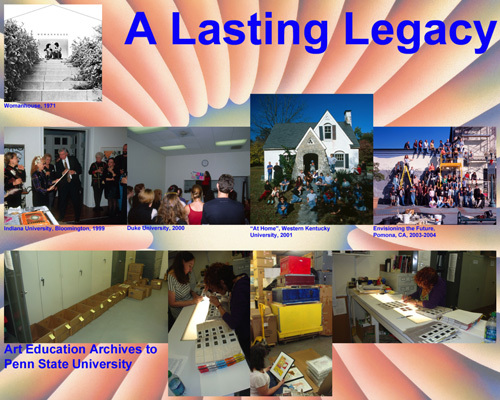 The collection, housed in the University Archives in the Special Collections Library, includes videos, photographs, and notes on Chicago’s teaching projects. The collection, a gift to the Libraries from artist, author, and educator Judy Chicago, complements The Dinner Party Curriculum Online Project, developed by Marilyn Stewart, Peg Speirs, and Carrie Nordlund, under the directorship of Marilyn Stewart, and in collaboration with Judy Chicago and Constance Bumgarner Gee, given by the Through the Flower organization (TTF) to Penn State’s College of Arts and Architecture for its art education program. Born in 1939 in Chicago, Illinois, Judy Chicago rose to fame in the 1970s and is best known for her 1974 monumental work “The Dinner Party,” the breathtaking, triangular table that is a symbolic history of women in western civilization and is now in the permanent collection of the Brooklyn Museum. She created three major collaborative projects afterwards: the “Birth Project,” “Holocaust Project,” and “Resolutions: A Stitch in Time.” She continues making thought-provoking art in new media today, including her work in glass since 2003. Chicago continues as the founding director of TTF. An influential non-profit feminist art organization, founded in 1978, the mission of TTF is to educate a broad public about the importance of art and its power to emphasize women’s achievements. The Dinner Party Curriculum is considered living because learning and teaching are generative, fluid processes situated in changing times and places. Inquiry, research, creation, critical dialogue, and reflection in the pedagogically designed encounters of The Dinner Party offer transformative learning approaches toward diversity, social justice and equity. As teachers and students adapt encounters with feminist art, ideas and feminist art pedagogy within their own life experience, they will continue to create a living feminist art curriculum.